I know half the world is just beginning Summer, and it’s a big temptation to take a bit of a break until September. But the cold hard facts are that in just a few weeks we’re going to be at the halfway point in 2010. If you expect anything to change in your life THIS YEAR, you’ve got just about six months to do it. Now understand this, that’s plenty of time IF you’re using the “secret” ingredient of every successful person I know. This video will help you discover and use that ingredient. After you’ve watched the video I’d appreciate it if you’d leave your comments below. And if it’s helpful to you, please Share It with a friend (or your teammates). Here are five simple steps you can take to achieve more in the next 90 days than you’ve achieved in the whole year put together. (And feel free to share with your friends!). Economic crisis have you frozen with fear and anxiety about the future? Now is no time to sit on your hands and pine for the good old days. Now is the time to Think Big! There’s a great Australian magazine (with print and online versions) that will help you do that. This month features a cover story on Bob Proctor and yours truly also has an article in the current issue. It’s also got a Recession Busting Guide as well as articles by Kim Kiyosaki, Loral Langemeier and Chris Howard to name a few. Get a free online subscription here…. The beginning of another year is less than three weeks away. Looking for some ways to “unleash your power” in 2009? 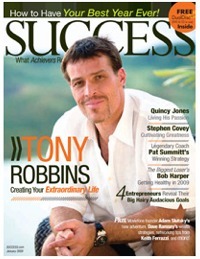 The January issue of Success Magazine has a cover story on Tony Robbins, four successful entrepreneurs talking about their big, hairy, audacious goals for 2009, and a feature article by yours truly. Check out the online issue here and then get treat yourself to a subscription for the New Year. The free CD and DVD every month are more than worth it. Almost 35 years after reading SUCCESS Magazine for the first time, I’m excited (and honored) to have an article in the newest issue that features Trump on the cover. While the format (and technology — each issue now includes a FREE DualDisc™ (CD & DVD in one)) has changed over the years, one thing hasn’t: it’s still the one-stop source of wisdom and insight from today’s leading entrepreneurs, CEO’s and personal development experts. Well-Being – Destressing, recharging and staying fit – and why it’s important! You can see our article on pages 34-35 and go here to subscribe to SUCCESS or call 800-570-6414.